Liszt was perhaps the greatest piano virtuoso of his era as well as being one of the great composers of the Romantic era. Liszt music includes piano concertos, symphonies, symphonic poems, sacred choral works, and many works for the solo piano (such as the Liebesträume [Dream of Love]). Liszt had the appearance of a tall, dark, handsome rock star. This is perhaps not a coincidence. Long before the days of Beatlemania, there was Lisztomania, and Liszt had crowds of frenzied female fans at his concerts. 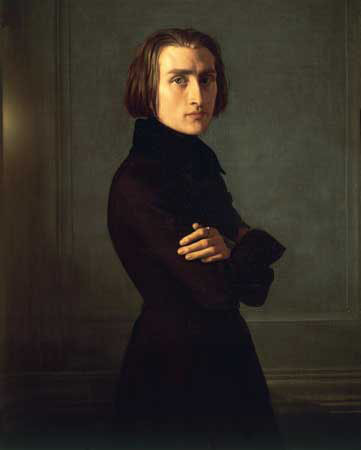 This painting of Liszt was done by Henri Lehmann in 1838. This work is now owned by the Musée Carnavalet, Paris, France. Liszt (at the age of 29) performing at the piano. The year is 1840; the place is a salon in Paris. In the audience we can see famous writers, musicians and members of society's elite, including Alexandre Dumas (or Alfred de Musset), Victor Hugo (or Hector Berlioz), the French novelist, Georges Sand, the Italian composer and virtuoso violinist, Niccolò Paganini, the Italian opera composer, Gioacchinio Rossini, and Liszt's mistress, the Countess Marie d'Agoult. Sitting on the grand piano is a bust of Beethoven, at the far left is a statue of the French national heroine, Joan of Arc, and on the wall is a portrait of the romantic poet and revolutionary fighter, Lord Byron. 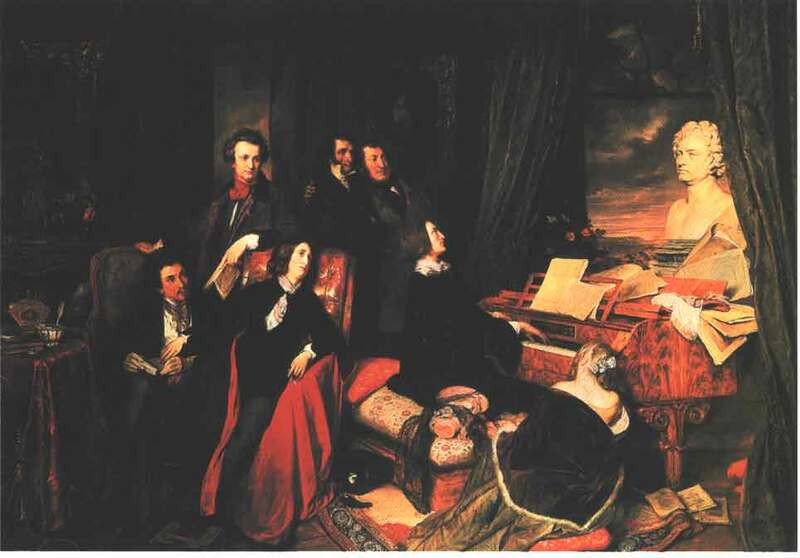 This painting, Franz Liszt, am Flügel phantasierend (Franz Liszt Fantasizing at the Piano) (1840), was done by the Austrian painter, Josef Danhauser and was commissioned by the famous piano builderr, Conrad Graf. This piano is now on show in the Franz Liszt House in Budapest, Hungary (formally known as the Liszt Ferenc Memorial Museum, and, in Hungarian, as the Liszt Ferenc Emlekmuseum). 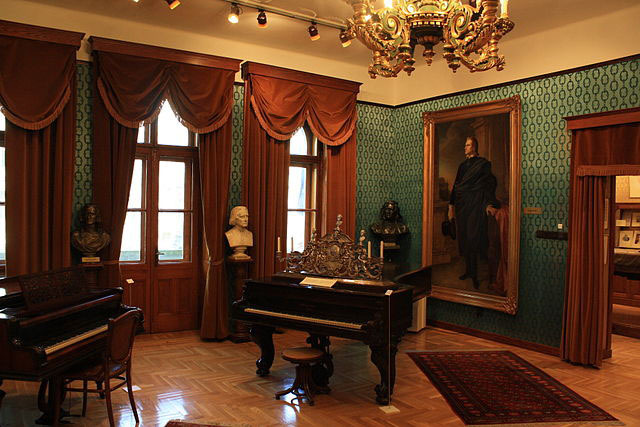 This museum which is a reconstruction of the above-mentioned apartment, contains antique pianos that used to belong to the composer, musical scores, books, furniture, personal belongings and other Liszt memorabilia. 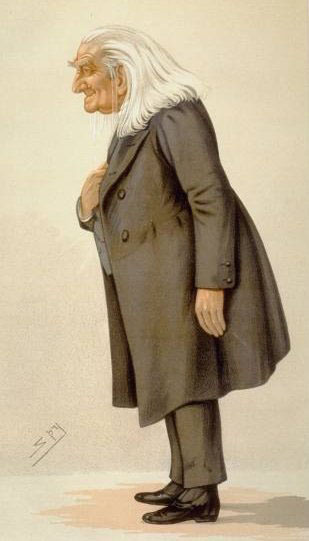 A caricature of Franz Liszt that was published in the magazine, Vanity Fair on 15 May 1886. The caption underneath the caricature read "the Abbé" (the Priest). Liszt as a priest (as suggested by his clerical clothing, by the open Bible and church organ) and as a musician (as suggested by the musical instruments), as depicted on this stamp issued by Monaco in 1986. 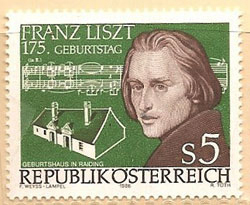 On this postage stamp we see images of Liszt, of one of his music scores, and of the house in Raiding (located now in Austria but until 1921-22 in the Kingdom of Hungary) where the composer was born. 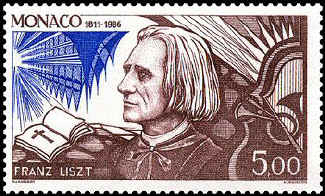 This stamp was issued by Austria in 1986, on the occasion of the 150th anniversary since Liszt's birth. Note: This picture gallery page includes drawings, paintings, photos and images of Franz Liszt, his music, activities, friends and family, and the various places where the composer lived and wrote.